1. To add photos and videos to your account, click "Collateral" on the left navigation and then click "Media." 2. You will now be presented with your property’s images to possibly be used in listings and special offers. The pencil icon will allow you to edit an existing image. By clicking the red x icon, you can delete an existing image. The clone icon will allow you to duplicate an image. You can also Add New Images by clicking the button. 3. Once you choose to edit, clone, or add images, you will see the Media Information section. Choose "TYPE" to identify if your media is a logo, image, or video (YouTube link). You can browse your hard drive or drag and drop a file. Once you upload a new image/video (or edit an existing one), attach the image/video to one or multiple listings by selecting the Listings dropdown menu. 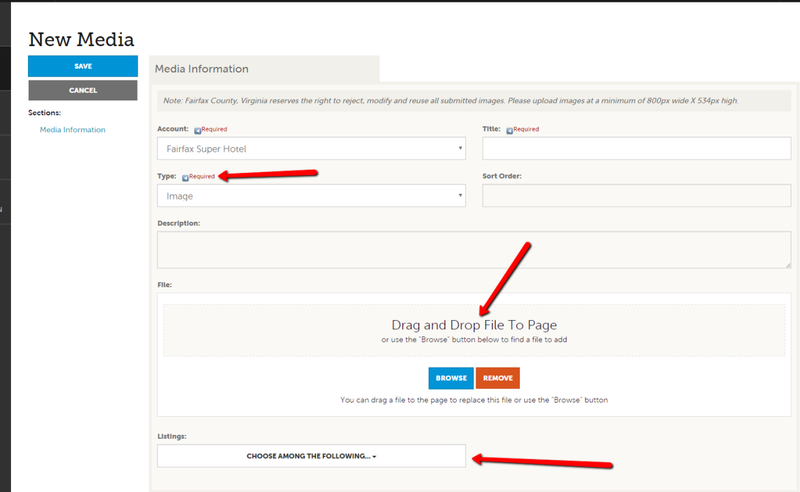 Don&apos;t forget to "SAVE" before closing - this will submit your images to Visit Fairfax. IMPORTANT: Please only upload horizontal images at a minimum of 800x534 pixels. If you do not enter high-resolution images, your photos on www.fxva.com may appear blurry. Visit Fairfax reserves the right to reject, modify, or reuse any image submitted. For additional assistance with images and/or video, please contact Ali Morris at 703.752.9505 or amorris@fxva.com. Next step: Looking for help with sales leads? Click here.